Mum says there is so much love energy in it, especially in my eyes. I love everything about your art. Love the background and of course what cat doesn’t look adorable doing the head tilt. You always look adorable, but this one is extra special. You do look so adorable and we can see what your Mum means! Happy Caturday Athena & Mum! Yes your really do ! Yes, you do look wonderful! Looking dreamy and adorable Athena...but then you always do! We enjoyed the blurry background enhancing your soulful eyes. Your Mom couldn't be more right about the love energy coming through here ... one feels it right away ... how very lovely this is! Yes, Athena, there is a lot of love expressed in those eyes. This is such a gorgeous photo! 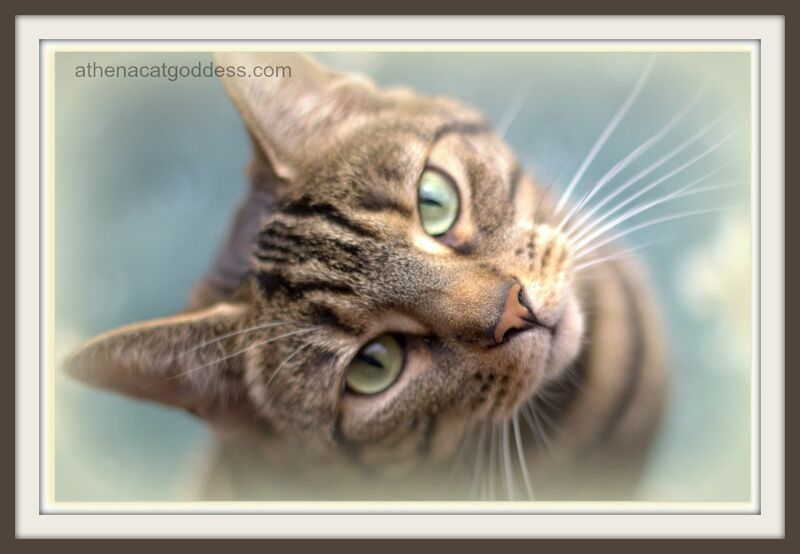 You are such a gorgeous tabby girl Athena! Mum is right, Athena. That is a beautiful and lovely picture of you! Beautiful photo! And the background really makes it stand out. Great Caturday Art. Oh yes, you are SO full of love in that pic! Lovely! Athena, you look absolutely lovely. You are incredibly adorable there, Athena! We nominated you for da Eight Photos of Happiness challenge - ya can see the guidelines here. Have fun! OMC OMC OMC!!!! First, there was a lil panic, as Lady realized she forgot to put the art work online, when it was still Saturday over here. Lucky this hop was still open, and she was able to add it on Sunday morning. Second, you look so adorable in the picture Athena, your mama is absolutely right about your eyes.